The P2X7 receptor (P2X7R), an ATP-gated ion channel, has been implicated in the process of cell-to-cell fusion into multinucleated macrophages (MA), but its contribution to MA fusion driven by physiological/pathological stimuli is not clearly established. Based on several lines of evidence, we demonstrate that P2X7R is critical for the induction of multinucleated MA by the inflammatory cytokine GM-CSF: 1) pharmacological inhibition of P2X7R with oxidized ATP (oATP), KN-62, and the selective antagonist A740003 abrogated GM-CSF action on rat alveolar MA and murine peritoneal MA; 2) a murine J774 P2X7 low MA clone, selected for defective P2X7R function, was unresponsive; 3) MA from mice lacking P2X7R failed to respond to GM-CSF, in contrast to wild-type. GM-CSF also stimulated ATP-induced membrane permeabilization in J774 P2X7 high MA and rat alveolar MA, an effect absent in the P2X7 low MA clone and inhibited by the P2X7 blockers oATP and KN-62. Notably, the stimulatory effects of GM-CSF on pore formation and MA fusion were both inhibited by blocking functional Pannexin-1 (Panx-1), and GM-CSF failed to stimulate MA fusion in cells from Panx-1 knockout mice. We provide further evidence that extracellular ATP release from peritoneal MA is dependent on P2X7 but not on Panx-1 expression and that its metabolism to adenosine mediates P2X7-dependent MA fusion. 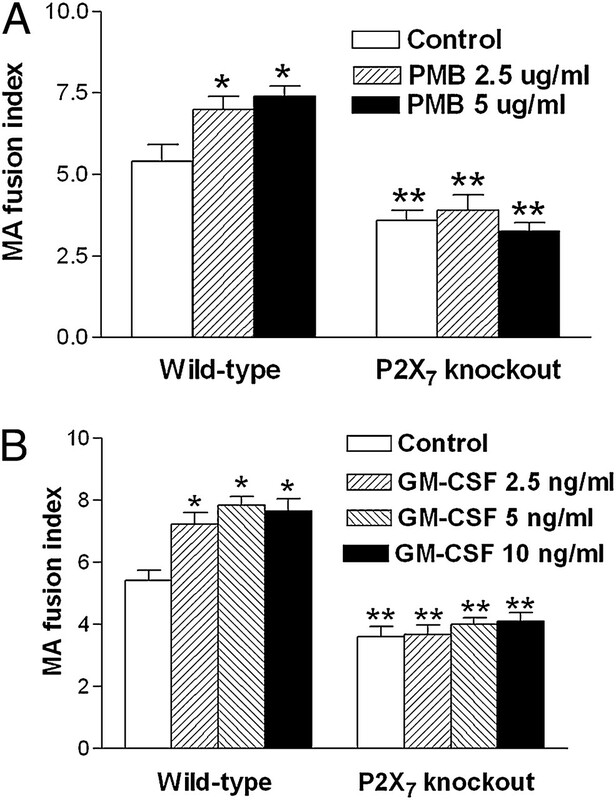 These data demonstrate that both P2X7 and Panx-1 are required for GM-CSF promotion of MA fusion but likely act independently through different signaling pathway(s). Macrophages (MA) are present in all tissues, and cell-to-cell communication between MA themselves and with other cells is crucial in a wide range of biological processes such as tissue repair, immune reactions, and metastasis (1, 2). Homotypic fusion of MA into multinucleated giant cells has long been recognized both in homeostasis and disease. This specialized form of MA differentiation is critical for the normal development of osteoclasts, the cells responsible for bone resorption (3, 4). Such process is also an important component of host responses in various pathological conditions. For instance, the presence of multinucleated MA is a hallmark of chronic inflammatory reactions that take place in infective granulomas, foreign body reactions, and sterile inflammation (4, 5). Notably, multinucleated MA have been observed in tuberculosis (5), yeast infection (6), HIV infection (7), failure of orthopedic implants (8), and sarcoidosis (5, 9). Accordingly, a number of cytokines produced by immune cells including GM-CSF, M-CSF, IL-4, IL-13, and IL-6, alone or in combination, have been reported to stimulate the appearance of multinucleated MA in various cell culture systems (4, 10–14). Despite the widespread observation of MA fusion in vitro and in vivo, the mechanisms underlying this process remain poorly understood. It is thought that MA–MA fusion is mediated by receptor–ligand interaction, and several cell membrane molecules such as β-integrins receptors (4), CD44 (15), CD47 (16), CD98 (17), the transmembrane glycoprotein ADAM 9 (18), and the dendritic cell-specific transmembrane protein (DC-STAMP) (12) have been identified as mediators of the fusion process. In particular, DC-STAMP was found to be essential for cell–cell fusion in osteoclasts and MA, as mice lacking the DC-STAMP gene failed to form multinucleated MA and osteoclasts (12). Significant evidence also supports the implication of the purinergic P2X7 membrane receptor in osteoclast formation (19, 20) and in the fusion of various MA preparations (21, 22) including those from patients with sarcoidosis (9, 23). The P2X7 receptor (P2X7R), a member of the P2X family of nucleotide receptors, displays several attributes that make it an attractive candidate as a potential modulator of intercellular communication and MA fusion in inflammation. The P2X7R is expressed by MA (21, 22) and osteoclasts (19) and is activated by extracellular ATP, a danger signal known to be present at sites of injury and inflammation (24). Quite notably, activation of P2X7R by ATP could trigger further release of ATP (25), an extracellular messenger that can propagate cell-to-cell signaling (26). 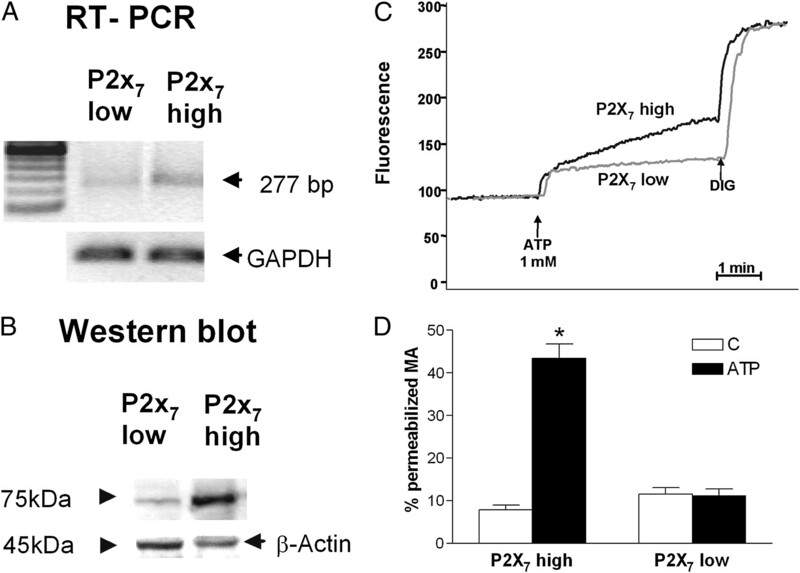 Moreover, because of its ability to destabilize lipid bilayer and form a membrane pore (27), P2X7 is a relevant membrane protein as a mediator of MA cell–cell interaction. In this respect, the permeabilization pore coupled to P2X7R has been ascribed to the hemichannel protein Pannexin-1 (Panx-1) (28, 29). 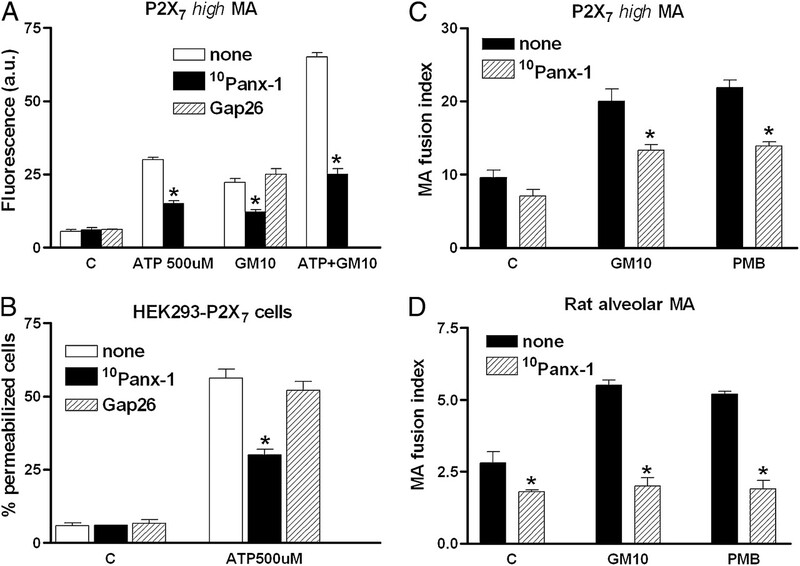 Panx-1 has been shown to be a component of P2X7R signaling pathways and has been implicated in the release of ATP from several cell types (30). In addition, the P2X7R reportedly interacts with connexin-43 (CX-43) (31), another hemichannel protein linked to ATP release (32). It has been suggested that the presence of functional P2X7 at the cell surface may facilitate membrane insertion of CX-43 and the formation of gap-junction channels between MA (31). Therefore, the possibility exists that P2X7-coupled Panx-1 and/or CX-43 may participate in MA–MA interaction and fusion. In contrast to DC-STAMP, the P2X7R is not an absolute requirement for the fusion process, as osteoclast formation was observed in mice lacking the P2X7R (33). However, unequivocal evidence for the participation of P2X7 in the process of multinucleated giant cells (MGC) formation was obtained using heterologous cell systems expressing only the P2X7R. HEK293 cells stably transfected with the rat P2X7R displayed increased cell fusion, and their stimulation with polymyxin B (PMB), a positive allosteric modulator of P2X7 (34), further increased the formation of MGC (35). These effects required a functional receptor, as cells transfected with a truncated P2X7R lacking the C-terminal domain and devoid of pore-forming activity failed to form MGC. In line with this, a previous study reported that osteoclast formation in RAW macrophage-like cells was prevented by downregulation of P2X7R in cells made resistant to ATP and transiently devoid of pore formation but resumed upon recovery of P2X7-dependent pore-forming activity (20). Based on these observations, we postulated that although P2X7 is not an integral component of the fusion machinery, it may be required for efficient promotion of MA fusion in response to inflammatory cues. Therefore, the current study was undertaken to explore the role of native P2X7R in the generation of multinucleated MA driven by a physiological/pathological stimulus such as GM-CSF (10, 11, 14, 36–39). It is noteworthy that both GM-CSF and P2X7R have been implicated in a number of inflammatory/autoimmune diseases in which multinucleated MA are present (8, 39–44). To address this issue and gain insight into the signaling pathways involved, we used various MA preparations that express either a functional or a defective P2X7R as well as MA from mice with a deleted P2X7R gene. Our results demonstrate that P2X7R is critical for efficient promotion of MA fusion by GM-CSF and that this process involves extracellular ATP release and its metabolism to adenosine. Through the use of Panx-1 mimetic peptides as well as MA from Panx-1 knockout mice, we also provide for the first time, to our knowledge, evidence that Panx-1 is also required but likely acts through different mechanism(s). Lung pathogen-free male Wistar rats (225–250 g) were purchased from Harlan (Indianapolis, IN). These animals were shipped behind filter barriers and housed in isolated temperature-controlled quarters under pathogen-free conditions in an animal isolator unit (Johns Scientific, Toronto, ON, Canada). C57BL/6 mice were ordered from Charles River (St. Constant, QC, Canada) or Harlan. Animals were given standard laboratory chow and water ad libitum and were used within 2 wk. Approval was obtained from the Animal Care and Use Committee of the University of Ottawa and the University of Ferrara for all procedures. Mice carrying a targeted null mutation of the P2X7 gene or lacking the Panx-1 gene were kindly supplied by Glaxo SmithKline (Harlow, U.K.) and H. Monyer (Department of Clinical Neurobiology, University Hospital of Neurology, Heidelberg, Germany), respectively. The C57BL/6 mice (male and female) lacking the P2X7R or the Panx-1 hemichannel protein were used at 8–10 wk of age. Successful transmission of the disrupted P2X7R gene was confirmed by the PCR and Western analysis and by monitoring loss of P2X7 function using ATP-activated ethidium bromide (EtBr) uptake by peritoneal MA. IMDM was purchased from Invitrogen (Burlington, ON, Canada and Milan, Italy). Lab-Tek culture chambers were obtained from Nalge Nunc International (Rochester, NY). Rat and mouse recombinant GM-CSF were obtained from R&D Systems (Minneapolis, MN), and ATP, PMB, oxidized ATP (oATP), adenosine, adenosine deaminase, and poly-l-lysine were purchased from Sigma-Aldrich (St. Louis, MO). EtBr was obtained from Molecular Probes (Eugene, OR). TRIzol reagent was from Invitrogen. The ACCESS RT-PCR kit and the Enliten rluciferase/luciferin kit were from Promega Italia (Milan, Italy). Gap 26 and Gap 27 connexin mimetic peptides, A740003, KN-62, and ARL 67156 were obtained from Tocris Biosciences (Bristol, U.K.), and 10Panx-1 mimetic peptide was from Biopeptide (San Diego, CA). Bronchoalveolar lavage was performed in normal rats as described (10). Briefly, the lungs were lavaged with seven 7-ml aliquots of sterile PBS (pH 7.4) (Wisent, St. Bruno, QC, Canada), and bronchoalveolar cells were collected by centrifugation at 200 × g at 4°C for 5 min. The cells were resuspended in complete culture medium, which was composed of IMDM supplemented with 10% dialyzed FBS (Wisent), 0.005% gentamicin (Invitrogen), and 0.8% HEPES. Cells were counted in a hemacytometer chamber, and viability (98–100%) was determined by trypan blue exclusion. Differential analysis of cytocentrifuge smears (Thermo Shandon, Pittsburgh, PA) of lavage cells (2.5 × 104 cells) stained with Wright–Giemsa indicated that the bronchoalveolar cell population was essentially composed of MA (99%). Wild-type and P2X7 and Panx-1 knockout mice were killed by ether inhalation and wet with 70% ethanol. A transverse cut in the inguinal area was made to expose completely the peritoneal wall, which was flooded with 70% ethanol. The peritoneal wall was lifted with soft forceps, and 4.5 ml sterile PBS was injected into the peritoneal cavity taking care not to puncture the viscera and cause bleeding. The peritoneum was gently massaged, and 3.5 to 4 ml of fluid was recovered (at least 75%). Peritoneal MA were collected by centrifugation (200 × g for 5 min at 4°C), counted with a hemacytometer, and ∼2 × 106 to 3 × 106 cells were obtained per mouse. The P2X7 low MA variant clone was selected as described (45) by repeated rounds of incubation in the presence of 5 mM ATP, followed by cloning by limiting dilution. The P2X7 high MA clone was selected by limiting dilution and a high ATP-dependent uptake of EtBr. The P2X7 high and low MA clones were grown in DMEM supplemented with 10% heat-inactivated FBS, penicillin (100 U/ml), and streptomycin (100 μg/ml) (Invitrogen). P2X7-transfected HEK293 cells (35) were cultured in DMEM/Ham’s medium (F-12) (1:1) (Invitrogen Life Technology) containing 15% heat-inactivated FBS (Wisent), 100 U/ml penicillin, and 100 μg/ml streptomycin. The generation of MGC from various MA preparations was performed as described previously (10), with slight modifications. For rat alveolar MA, cells (2 × 105) were plated in 8-well LabTek tissue culture chambers in 200 μl complete IMDM medium. For mouse peritoneal MA-derived MGC, peritoneal cells (2 × 105) were plated in 8-well LabTek culture chambers in complete IMDM medium and allowed to adhere for 1 h at 37°C in 5% CO2. The adherent cells were washed once with fresh medium and incubated for an additional 30 min before stimulation. Approximately 75–80% of plated peritoneal cells were adherent and had macrophage characteristics. Each cell preparation was then incubated in the presence and absence of either PMB or GM-CSF at the indicated concentrations for 48 h at 37°C in 5% CO2. In some experiments, cells were pretreated with oATP (100 μM) for 2 h prior to stimulation. For the generation of MGC in the J774 P2X7 high and P2X7 low variants, cells (1 × 105) were plated in DMEM supplemented with 10% heat-inactivated horse serum and incubated for 48 h in the presence and absence of PMB or GM-CSF at the indicated concentrations. After incubation of the various MA preparations, the medium was removed and the cell monolayer washed gently with prewarmed (37°C) PBS. Cells were then fixed with 4% paraformaldehyde for 10 min and washed subsequently three times with PBS. After drying, the chambers were disassembled, stained with H&E, and mounted with coverslips and Permount (Fisher Scientific, Ottawa, ON, Canada) for microscopic evaluation. Ten fields (original magnification ×40) were monitored for the presence of MGC with three or more nuclei. Images were captured and analyzed with the Northern Eclipse image analysis software coupled to a Zeiss microscope. Stained cells were counted with the help of the Man Count software linked to Excel in separate color-coded classes (1, 2, 3, 4 or more nuclei), and the total number of cells with >3 nuclei (MGC) were derived from these values. The fusion index (f.i.) was calculated as f.i. = total number of nuclei in MGC ÷ total number of nuclei counted × 100. The P2X7-dependent increase in plasma membrane permeability was measured by monitoring EtBr uptake over time as described previously (35). Briefly, J774 P2X7 high MA (5 × 105/ml) were incubated in Ca2+-free saccharose saline solution containing EDTA (300 mM sucrose, 1 mM K2HPO4, 1 mM MgSO4, 5.5 mM glucose, 0.5 mM EDTA, pH 7.4) with EtBR (20 μM) in a thermostated (37°C) fluorometric cuvette under constant magnetic stirring. After equilibration for 5 min, cells were stimulated by the addition of ATP (1 mM), and uptake of the fluorescent dye was monitored for 25 min. At that time, complete permeabilization of cells (100% fluorescence signal) was achieved by adding digitonin (200 μM) (Sigma-Aldrich). Fluorescence was measured at 360 nm/580 nm excitation/emission wavelengths in a PerkinElmer LS50 spectrofluorometer (PerkinElmer, Waltham, MA). Pore-forming activity was also assessed by determining the percentage of cells that became permeabilized to EtBr as described previously (22, 35). MA (1 × 105) were incubated in 200 μl complete medium as indicated in 96-well tissue culture plates. The medium was then replaced with standard saline solution containing 125 mM NaCl, 5 mM KCl, 1 mM MgSO4, 1 mM Na2HPO4, 5.5 mM glucose, 5 mM NAHCO3, 1 mM CaCl2, and 20 mM HEPES (pH 7.6), EtBr (20 μM) was added, and cells were incubated with and without ATP as indicated for 5 min at 37°C. The reaction was stopped by rapid centrifugation (200 × g, 1 min), and the culture supernatants were replaced with fresh saline solution. The resulting EtBr fluorescence was analyzed using a Zeiss Axiovert S11OOTV inverted microscope equipped with a rhodamine filter and a 32× objective. Images of 10 separate fields (original magnification ×32) were captured for each sample and analyzed with the Northern Eclipse image analysis software. Data are expressed as percentage of cells that become permeabilized to EtBr or fluorescence arbitrary units as determined by densitometry level/500 cells. Total RNA was extracted using TRIzol reagent (Invitrogen) as per the manufacturer’s instructions. Reverse transcription was carried out using specific primer sequences for mouse P2X7R (sense 5′-ATATCCACTTCCCCGGCCAC-3′; antisense 3′-TGCGCAGTCATGGCACCAT-5′) and GAPDH (sense 5′-CAAGGAGTAAGAAACCCTGAC-3′; antisense 3′-AATTGTGAGGGAGATGCTCAGT-5′). The RNA samples (100 ng) were reversed transcribed using the ACCESS RT-PCR kit (Promega). After reverse transcription, the PCR products (5 μl) were analyzed for P2X7R gene on a single 1.5% agarose gel stained with EtBr. Cells were lysed by repeated freezing/thawing (three cycles) in lysis buffer containing 300 mmol/l sucrose, 1 mmol/l K2PO4, 1 mmol/l MgSO4, 5.5 mmol/l glucose, 20 mmol/l HEPES (pH 7.4), 1 mmol/l benzamidine, 1 mmol/l phenyl-methylsulfonyl fluoride, 0.2 μg DNase, and 0.3 μg RNase. Proteins (30 μg/lane) were separated on 7.5% SDS-polyacrylamide gel according to Laemli and blotted overnight on nitrocellulose membrane. The nitrocellulose membrane was incubated with either anti-P2X7 or anti-actin Ab (Sigma-Aldrich, St. Louis, MO) followed by peroxidase-conjugated anti-rabbit Igs as described (34). Extracellular ATP was measured in the culture supernatants with the rluciferase/luciferin method as described previously (25). Peritoneal MA (5 × 104/well) from wild-type and knockout mice were plated in 96-well plates and incubated overnight. The next day, the medium was replaced by saline/saccharose (300 mM saccharose, 1 mM MgSO4, 5.5 mM glucose, 20 mM HEPES adjusted to pH 7.4 with KOH) with or without GM-CSF (10 ng/ml) and cells incubated for 20 min. At the end of incubation, luminescence in each well was measured in a Victor2 Wallac PerkinElmer luminometer (PerkinElmer, Wellesley, MA) equipped with an automatic dispenser of an Enliten rluciferase/luciferin solution (100 μl). Data are expressed as counts of photons per second. In some experiments, ATP concentrations were calculated from a standard curve mapping arbitrary lights units to ATP concentrations. Mouse were anesthetized and the tail tip (0.6 cm) was cut with sharp surgical scissors and placed directly into a 1.5-ml tube. No treatment for hemostasis was required as the bleeding was minimal. To prevent cross-contamination between samples, the scissors were cleaned once with NaOH 5 M and washed three times with sterile water. Genomic DNA was extracted from the tail using NucleoSpin Tissue kit (Macherey-Nagel, Düren, Germany) according to the manufacturer’s instructions. Briefly, the tail tips were incubated at 56°C overnight with a pre-lysis buffer. The day after, lysis buffer was added to the overnight mixture, and the samples were then vigorously shaken and incubated at 70°C for 10 min. The DNA binding conditions were adjusted by adding absolute ethanol, and the samples were loaded on the columns. The silica membrane of the columns was washed twice, dried, and the genomic DNA was eluted into a new 1.5-ml microcentrifuge tube with a prewarmed (70°C) elution buffer. Genotyping was carried out by PCR analysis using PCR Master Mix (Fermentas, Burlington, ON, Canada) with the following conditions: denaturation at 95°C for 3 min (1 cycle) followed by 35 cycles at 95°C for 15 s; annealing at 55°C for 20 s, extension at 72°C for 30 s, followed by a final extension at 72°C for 5 min. The primers used for Panx-1 knockout mouse were the following: wtgin3, 5′-GGAAAGTCAACAGAGGTACC-3′; wtex 15, 5′-CTTGGCCACGGAGTATGTGTT-3′; lacseq12, 5′-GTCCCTCTCACCACTTTTCTTACC-3′. As control we looked for GAPDH amplification, using the following primer: forward, 5′-CAAGGAGTAAGAAACCCTGGAC-3′; reverse, 5′- AATTGTGAGGGAGATGCTCAGT-3′. PCR products were separated by agarose gel electrophoresis using 1.5% Agarose Electrophoresis Grade (Invitrogen, San Giuliano Milanese, Italy) and then visualized by EtBr staining. For genotyping analysis, the following bands were expected: wild-type (+/+) allele, 330 bp; knockout (−/−) allele, 630 bp; 100-bp DNA Ladder (Fermentas) was used as an m.w. marker. Results are expressed as mean ± SEM. Statistical significance was determined using a one-way ANOVA and Bonferroni test (p < 0.05; Instat; GraphPad, La Jolla, CA). Incubation of pure population of resident rat alveolar MA with GM-CSF for 48 h increased in a dose-dependent fashion (2.5–10 ng/ml) MA fusion into multinucleated MA by up to 3.1-fold, with an f.i. of 7.1 in the presence of GM-CSF compared with 2.3 in unstimulated cells (Fig. 1A, 1C). Notably, pretreatment of MA with oATP (100 μM), an irreversible blocker of P2X7R, abolished GM-CSF–induced MA fusion at all doses tested (Fig. 1A). Basal level of MA fusion was also inhibited by oATP (from 2.3 to 1.3), suggesting the presence of low level of P2X7 activation under our culture conditions, possibly due to components of the cell culture media or autocrine stimulation by mediators released in the extracellular milieu. GM-CSF promotion of rat alveolar MA- and peritoneal MA-derived MGC is inhibited by oATP. A and B, Rat alveolar MA (AM; 2 × 105) (A) and murine peritoneal MA (PMA; 2 × 105) (B) cultured in LabTek chambers were treated or not with oATP (100 μM) for 2 h. The cells were then incubated for 48 h in the absence and presence of increasing concentrations of GM-CSF (2.5–10 ng/ml) and the f.i. determined. Data represent mean ± SEM of three experiments. *p < 0.05 (significantly different from unstimulated cells), **p < 0.05 (significantly different from MA not treated with oATP). C and D, Representative phase-contrast images of multinucleated MA (original magnification ×40) derived from rat alveolar MA (C, arrows) and mouse peritoneal MA (D, arrows) treated with GM-CSF (10 ng/ml) for 48 h and stained with H&E. To verify whether such inhibitory effect was a selective property of the rat alveolar MA population that could be related to their anatomical compartment, we performed similar experiments using murine peritoneal MA. As shown in Fig. 1B and 1D, incubation with GM-CSF within the same concentration range also increased significantly, albeit at a lower level, the f.i. of peritoneal MA (from 4.5 to 8.1 or 1.8-fold). 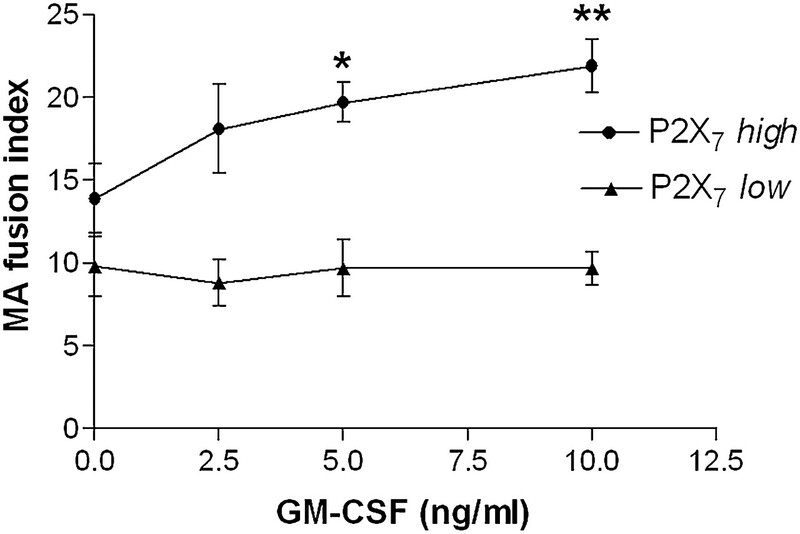 As observed for rat alveolar MA, pretreatment of murine peritoneal MA with oATP for 2 h abrogated as well in this MA preparation the promoting effect of GM-CSF at all concentrations tested (Fig. 1B). Although oATP has been widely associated with irreversible inhibition of P2X7R, it is known that oATP may exert inhibitory effects unrelated to P2X7 (46, 47). Therefore, we studied the effects of A740003, a specific antagonist of P2X7 in rat and mice (48). As illustrated in Fig. 2, treatment of peritoneal MA with A740003 (100 μM) abolished the promoting effect of GM-CSF (5 and 10 ng/ml) on the formation of multinucleated MA. GM-CSF–induced MA fusion is blocked by the selective P2X7 antagonist A740003. Murine peritoneal MA (PMA) were incubated with GM-CSF (5 and 10 ng/ml) in the presence of A740003 (100 μM) for 48 h. Data represent mean ± SEM of three experiments. *p < 0.01 (significantly different from MA incubated in the absence of A740003). To delineate the role of P2X7R in GM-CSF–induced formation of multinucleated MA, we used a second strategy taking advantage of stable mouse J774 MA clones that have been selected for either high or low expression of P2X7R. In contrast to P2X7 high MA, the P2X7 low MA clone selected by resistance to ATP displayed significantly lower P2X7 expression (Fig. 3A, 3B), as determined by RT-PCR and Western blot analysis, and little pore-forming activity, as measured by ATP-induced plasma membrane permeability (Fig. 3C) and decreased number of cells that become permeabilized to EtBr (Fig. 3D). Expression of P2X7 mRNA and protein in P2X7 low and P2X7 high MA. A, Total RNA was extracted from P2X7 high and low MA clones, and P2X7R mRNA levels were measured by RT-PCR. B, Cell lysates of P2X7 high and low MA were loaded on SDS-polyacrylamide gel (30 μg/lane), and P2X7R protein expression was analyzed by Western blotting. C, P2X7-dependent pore-forming activity was determined by incubating cells in the presence of 20 μM EtBr and ATP. P2X7 high and low cells (5 × 105/ml) were incubated at 37°C under constant stirring, and ATP (1 mM) was added. Uptake of fluorescence was monitored over time (25 min). Digitonin (DIG; 200 μM) was then added for 5 min to obtain the maximal fluorescence signal. Data are shown as rate of fluorescence increase in arbitrary units. D, Cells (1 × 105) were incubated in 96-well tissue culture plates for 24 h. The medium was replaced with standard saline solution and EtBr (20 μM) added. Cells were incubated at 37°C with ATP (3 mM) for 5 min. Fluorescence of cells permeabilized by ATP was analyzed by microscopy and capture image analysis, and data are expressed as percentage of cells that become permeabilized to EtBr. Data are mean ± SEM of three separate experiments. *p < 0.01 (significantly different from control). We then characterized the ability of these respective MA clones to fuse into MGC. As expected (45), the P2X7 high MA displayed greater basal f.i. compared with the P2X7 low MA (Fig. 4). Quite notably, incubation with GM-CSF (5 and 10 ng/ml) for 48 h further increased in a dose-dependent manner the f.i. by 1.7- and 1.8-fold (19.7 and 21.9, respectively, compared with 13.8 for unstimulated cells). By contrast, the f.i. of P2X7 low MA remained unchanged after incubation with GM-CSF (2.5–10 ng/ml). The P2X7 low MA failed to respond, even in the presence of higher concentrations of GM-CSF (20 ng/ml, data not shown). P2X7 low MA do not form MGC in response to GM-CSF. P2X7 high and low MA were incubated in LabTek chambers for 48 h under similar conditions in the presence and absence of GM-CSF (2.5–10 ng/ml). Data represent mean ± SEM of five experiments. *p < 0.05, **p < 0.02 (significantly different from P2X7 low MA). To confirm the implication of P2X7R in the formation of multinucleated MA, peritoneal MA were obtained from mice with a deleted P2X7R gene, and their ability to form MGC was determined. Basal MA fusion was observed in unstimulated peritoneal MA cultures from P2X7 knockout mice, but at a significantly lower level than that in MA from wild-type animals (with f.i. of 3.1 and 5.2, respectively) (Fig. 5A). Incubation with the peptide antibiotic PMB, a positive modulator of P2X7 (34), further enhanced the f.i. of peritoneal MA obtained from wild-type mice expressing the native P2X7R (7.5 with 5 μg/ml PMB compared with 5.2 for unstimulated cells). However, PMB within the same concentration range failed to increase the f.i. of peritoneal MA obtained from P2X7 knockout mice (3.4 and 2.9, respectively, for 2.5 and 5 μg/ml PMB compared with 3.1 for unstimulated control) (Fig. 5A). Therefore, selective activation of P2X7R promotes the formation of multinucleated MA. P2X7R is required for PMB and GM-CSF stimulation of multinucleated MA. A, Peritoneal MA obtained from wild-type and P2X7 knockout mice were incubated in LabTek chambers for 48 h in the presence and absence of PMB (2.5 and 5 μg/ml). PMB was added at the beginning of the culture. Unstimulated MA from wild-type mice had a higher f.i. than those from knockouts. Incubation with PMB further enhanced MA fusion in wild-type but not in knockout animals. Data represent mean ± SEM of seven experiments. *p < 0.05 (significantly different from unstimulated wild-type MA), **p < 0.01 (significantly different from PMB-stimulated wild-type MA). B, Peritoneal MA from wild-type and P2X7 knockout mice were incubated for 48 h in the presence of GM-CSF (2.5–10 ng/ml). At all concentrations tested, GM-CSF increased MA fusion in cell cultures from wild-type mice but not in those from knockout animals. Data represent mean ± SEM of seven experiments. *p < 0.01 (significantly different from unstimulated wild-type MA), **p < 0.01 (significantly different from GM-CSF–stimulated wild-type MA). We next determined whether the promotion of MA multinucleation by the proinflammatory cytokine GM-CSF requires a P2X7R-dependent pathway. To this aim, peritoneal MA obtained from wild-type and P2X7 knockout mice were incubated under similar conditions with various concentrations of GM-CSF (2.5–10 ng/ml), and the generation of MGC was monitored. As illustrated in Fig. 5B, GM-CSF increased significantly the f.i. of MA from wild-type animals. By contrast, the lower f.i. observed in MA cultures from P2X7−/− knockout mice remained unchanged after incubation with GM-CSF at all concentrations tested demonstrating that GM-CSF fails to promote MGC formation in MA lacking the P2X7R. To investigate potential contribution of P2X7-dependent pore-forming activity in the promotion of MA multinucleation, dye uptake studies were performed with P2X7 high and low J774 MA clones as well as rat alveolar MA treated with GM-CSF. Incubation with GM-CSF (5 and 10 ng/ml) for 5 min induced rapid EtBr uptake in both P2X7 high MA clone and rat alveolar MA as evidenced by increases in the number of permeabilized cells (Fig. 6A) and in cell fluorescence intensity (Fig. 6B) compared with unstimulated control cells. The GM-CSF effects were smaller (40–50% less) than those of 5 mM ATP used as a positive control (Fig. 6A). By contrast, GM-CSF (5 and 10 ng/ml) did not induce higher EtBr uptake in the P2X7 low MA suggesting that it exerts a permeabilizing effect through the P2X7R. Consistent with this, the GM-CSF–induced permeabilization of MA expressing native P2X7R was significantly inhibited by oATP (Fig. 6A) and the P2X7 receptor antagonist KN-62 (Fig. 6B). 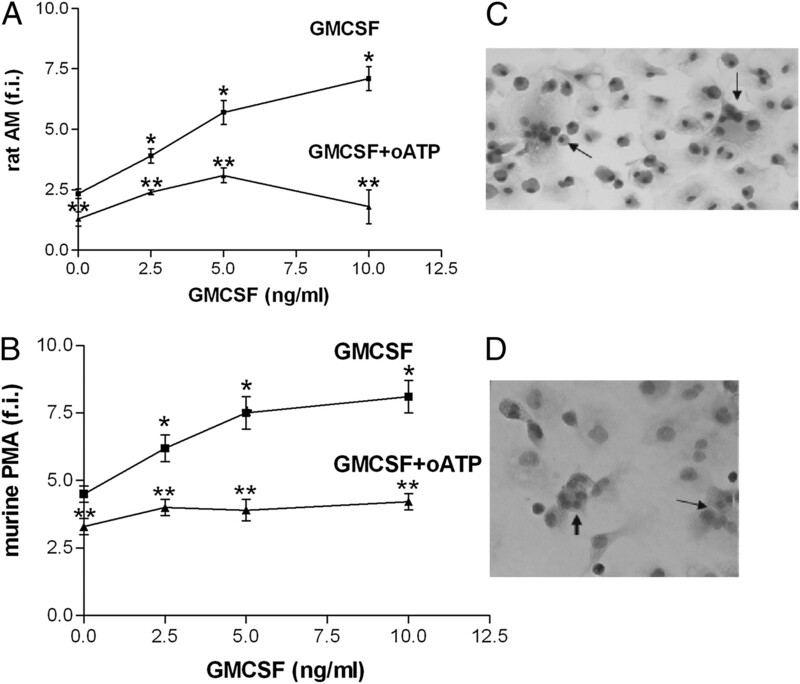 Notably, GM-CSF enhanced significantly the permeabilizing effect of lower concentrations of ATP (500 μM) (Fig. 6B) indicating that it potentiates ATP stimulation of P2X7-dependent pore formation. GM-CSF increases P2X7-mediated dye uptake in MA. A, P2X7 high and low J774 MA as well as rat alveolar MA (2 × 105) were incubated in 96-well tissue culture plates. The medium was replaced with standard saline, EtBr (20 μM) was added, and cells were stimulated with either GM-CSF (5 ng/ml, GM5; 10 ng/ml, GM10) or ATP (5 mM) for 5 min. Parallel cultures of P2X7 high MA and rat alveolar MA were also treated with oATP for 2 h before stimulation with GM-CSF. The percentage of cells that became permeabilized to EtBr was analyzed by microscopy and capture image analysis. Data are mean ± SEM of three separate experiments. *p < 0.01 (significantly different from unstimulated cells), **p < 0.01 (significantly different from cells stimulated with GM-CSF). B, P2X7 high MA were treated or not with KN-62 (10 μM) for 5 min before stimulation with either GM-CSF (5 and 10 ng/ml), ATP (500 μM), or a combination of both. EtBr fluorescence intensity of permeabilized cells was analyzed by capture image analysis and densitometry. Data are expressed as fluorescence arbitrary units and are mean ± SEM of three separate experiments. *p < 0.01 (significantly different from unstimulated cells), **p < 0.01 (significantly different from stimulated cells). The P2X7R permeabilizing pore has been ascribed to the hemichannel protein Panx-1 (28, 29). To test whether Panx-1 plays a role in GM-CSF–induced membrane permeabilization, we used a short 10Panx-1 mimetic inhibitory peptide that reportedly inhibits functional Panx-1– and P2X7-mediated dye uptake (28). 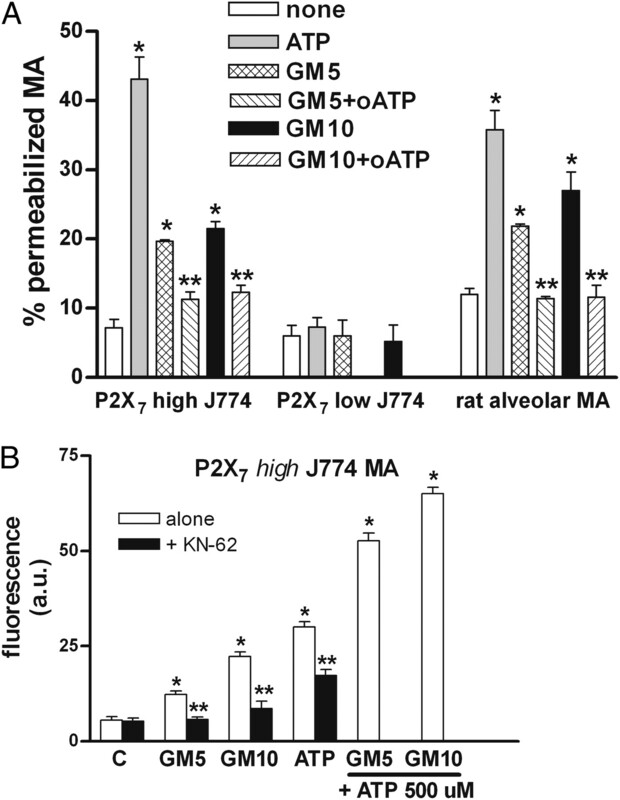 First, P2X7 high J774 MA were treated with 10Panx-1 to measure GM-CSF– and ATP-induced EtBr uptake. As shown in Fig. 7A, 10Panx-1 significantly reduced EtBr uptake in P2X7 high MA treated with ATP (500 μM), GM-CSF (10 ng/ml), or a combination of both. By contrast, the connexin mimetic peptides Gap 26 (300 μM) (Fig. 7A) and Gap 27 (data not shown), which target the extracellular loops of CX-43 (49), had no effect. In this respect, the P2X7 high MA behave quite similarly to HEK293 cells stably transfected with rat P2X7R, as ATP-induced EtBr uptake in these cells was also inhibited by 10Panx-1 (Fig. 7B) but unaffected by Gap 26 at a concentration (300 μM) reported to inhibit connexin-facilitated communication and ATP release from endothelial cells and retinal pigment epithelium (50, 51). These data, therefore, suggest that Panx-1 may play a role in membrane permeabilization that occurs after incubation with GM-CSF. GM-CSF–induced pore formation and MA fusion are inhibited by 10Panx-1 mimetic peptide. A, J774 P2X7 high MA were preincubated for 20 min with 10Panx-1 (0.2 mM) or Gap 26 (300 μM). EtBr (20 μM) was added, and cells were stimulated for 5 min with either GM-CSF (10 ng/ml, GM10), ATP (500 μM), or a combination of both as indicated. EtBr fluorescence intensity in 10 separate fields (original magnification ×32) was determined in each sample by capture image analysis and densitometry. Data are expressed as fluorescence arbitrary units. *p < 0.05 (significantly different from stimulated cells). B, HEK293 cells (4 × 104) stably transfected with the rat P2X7R were preincubated with 10Panx-1 (0.2 mM) or Gap 26 (300 μM) for 20 min, EtBr (20 μM) was added, and cells were stimulated with ATP (500 μM) for 5 min. Cell fluorescence was analyzed by microscopy and capture image analysis, and data are expressed as percentage of cells that become permeabilized to EtBr. Data are mean ± SEM of three separate experiments. *p < 0.05 (significantly different from cells stimulated with ATP). C and D, J774 P2X7 high MA (1 × 105) (C) and rat alveolar MA (2 × 105) (D) were treated or not with 10Panx-1 (0.2 mM) for 20 min then incubated in the presence or absence of GM-CSF (10 ng/ml, GM10) or PMB (10 μg/ml) for 48 h. Cells were analyzed in 10 random fields, and the f.i. was calculated. Data represent mean ± SEM of four separate experiments. *p < 0.05 (significantly different from stimulated cells). In the next set of experiments, we verified whether Panx-1 also participates in the promotion of multinucleated MA by GM-CSF. Cell fusion experiments were performed with P2X7 high J774 MA and rat alveolar MA expressing the native P2X7R. Fig. 7C and 7D shows that 10Panx-1 mimetic peptide inhibited the stimulatory effect of GM-CSF and PMB on MA fusion in both cell preparations. It is known that some mimetic peptides can cross-inhibit both Panx-1 and connexin channels (52). To confirm the participation of Panx-1 in GM-CSF–induced MA fusion, we performed fusion studies using peritoneal MA from mice with an homologous deletion of Panx-1 (Fig. 8A). As shown in Fig. 8B, increased MA fusion was observed in response to GM-CSF in peritoneal MA obtained from wild-type mice. However, disruption of the Panx-1 gene abolished the stimulatory effect of GM-CSF on MA fusion thus confirming the participation of Panx-1 in GM-CSF–induced MA fusion. Panx-1 knockout mice do not form increased number of multinucleated MA in response to GM-CSF. A, Genotyping of wild-type and panx-1 knockout mice. Conventional PCR analyses were performed on DNA isolated from tail biopsy tissue, and PCR amplicons were fractionated on a single 1.5% agarose gel. The expected PCR amplicon corresponding with Panx-1 is seen in wild-type mice (lanes 1 and 2) but is absent in animals with a homologous deletion of Panx-1 gene (lanes 3–8). B, Peritoneal MA from wild-type and Panx-1 knockout mice were incubated for 48 h with GM-CSF (10 ng/ml). Data represent mean ± SEM of six experiments. *p < 0.05 and p < 0.01 (significantly different from unstimulated wild-type MA), **p < 0.01 (significantly different from GM-CSF–stimulated wild-type MA). Recently, P2X7 and Panx-1 have been identified as ATP release conduits/channels (25, 53). To verify whether this extracellular messenger is involved in the promotion of multinucleated MA by GM-CSF, first we compared the capacity of peritoneal MA from wild-type and P2X7 knockout mice to release ATP. At time 0 in culture, MA obtained from wild-type mice released 1,200 nM ATP/106 cells compared with 750 nM ATP/106 cells for MA from P2X7 knockouts (Fig. 9A). By 5 min of incubation, these levels declined at similar rate to 750 and 230 nM ATP, respectively, reaching steady-state levels of 180 nM ATP by 20 min. Therefore, the presence of P2X7R is linked to higher basal ATP release and, hence, a greater ability to mediate intercellular communication. Moreover, incubation with GM-CSF (10 ng/ml) for 20 min (under steady-state conditions) stimulated greater ATP release (up to 2.1-fold) in MA from wild-type mice but not in MA from mice lacking the P2X7 gene (Fig. 9B). In contrast, no significant difference in ATP release was observed in MA obtained from Panx-1 wild-type and knockout mice indicating that Panx-1 involvement in MA fusion is not related to extracellular release of ATP. The P2X7R but not Panx-1 is linked to higher ATP release. A, Rapid burst of ATP release by MA (5 × 104) from P2X7 wild-type and knockout mice was observed at a higher level in wild-type compared with knockout and decreased to steady-state levels by 20 min incubation. B, MA (5 × 104) from P2X7 wild-type, P2X7 knockout, Panx-1 wild-type, and Panx-1 knockout mice were incubated under steady-state conditions (20 min; T20) in the presence and absence of GM-CSF (10 ng/ml), and ATP levels were determined by the rluciferin/luciferase assay. Data represent means ± SEM of three experiments. *p < 0.05 (significantly different from unstimulated WT MA). KO, knockout; WT, wild-type. Extracellular ATP can either signal directly to ATP receptors including P2X7R or may function as a metabolite after conversion via ecto-enzymes. We next investigated a potential link between extracellular ATP and GM-CSF promotion of multinucleated MA. For this purpose, P2X7 high MA were incubated in the presence of apyrase, an ecto-enzyme that degrades extracellular ATP (54). Treatment with apyrase (4 U/ml) increased significantly GM-CSF–induced MA f.i. (Fig. 10A) suggesting the involvement of ATP metabolites in this process. Because extracellular ATP can be dephosphorylated to adenosine by the serial actions of ecto-apyrase and ecto-5′ nucleotidase, the effects of adenosine deaminase, a catabolic enzyme that decreases adenosine levels thus preventing adenosine receptor engagement (55), was determined. As illustrated in Fig. 10B, treatment of MA with adenosine deaminase (2 U/ml and 4 U/ml) abrogated GM-CSF promoting effects suggesting the contribution of adenosine as a downstream effector of GM-CSF–induced MA fusion. In support of this, treatment with exogenous adenosine (500 nM) rescued GM-CSF promotion of MA fusion in P2X7 knockout mice (Fig. 10C). P2X7-dependent MA fusion involves extracellular ATP metabolism to adenosine. A, Treatment with apyrase potentiates GM-CSF induction of multinucleated MA. P2X7 high MA (2 × 105) were incubated in LabTek chambers with or without GM-CSF for 48 h in the presence and absence of apyrase (1 and 4 U/ml). Data represent mean ± SEM of three experiments. *p < 0.05 (significantly different from untreated). B, Treatment with adenosine deaminase (ADA) abrogates GM-CSF–induced multinucleated MA. P2X7 high MA (2 × 105) were incubated with or without GM-CSF (5 and 10 ng/ml) for 48 h in the presence and absence of ADA (2 and 4 U/ml).Data represent mean ± SEM of three experiments. *p < 0.05 (significantly different from untreated). C, Suppression of MA fusion in P2X7 knockout was rescued by treatment with exogenous adenosine (ADO). MA (1 × 105) were incubated for 5 d with and without GM-CSF (10 ng/ml) in the presence and absence of ADO (500 nM) or ARL 67156 (500 μM). After 3 d, the medium was replaced with fresh medium supplemented with the various stimuli. Data represent mean f.i. ± SEM of three experiments. *p < 0.05 (significantly different from controls). In this study, we demonstrate a clear effect of P2X7R disruption and P2X7 gene deletion on the ability of MA to fuse into MGC. While MA fusion is lower in macrophage preparations treated with the irreversible P2X7R blocker oATP and in J774 MA clones displaying low P2X7 expression and activity, definitive experimental evidence for a critical role of P2X7R in this process was provided by experiments using peritoneal MA obtained from animals lacking the P2X7R-encoding gene. Absence of the P2X7 gene was correlated with a significantly lower MA f.i. The gene deletion did not completely abolish the capacity of peritoneal MA to fuse indicating that resident MA can differentiate into MGC by P2X7-independent process(es), albeit less efficiently. This is in agreement with a previous report that mice lacking P2X7R can form multinucleated osteoclasts (33). In connection with this, prolonged exposure of osteoclast precursors from P2X7-null mice to ATP was shown to inhibit osteoclast fusion raising the possibility that other P2 receptors may also participate in this process (56). Quite notably, in keeping with our previous studies using P2X7R stably transfected cells and primary cultures of rat alveolar MA (35), incubation of murine peritoneal MA with the peptide antibiotic PMB increased MA f.i., but this stimulatory effect was completely abolished in MA lacking the P2X7 gene. Besides confirming the role of PMB as a positive modulator of P2X7R (34) in MA preparations known to express other ATP-gated P2X receptors, a significant finding of the current study is that P2X7R activation is directly coupled to the promotion of multinucleated MA. Most importantly, we clearly demonstrate that GM-CSF promotion of multinucleated MA is strictly dependent on the presence of a functional P2X7R thus providing unequivocal evidence that P2X7R may be linked to the generation of multinucleated MA driven by inflammatory cytokines. Such P2X7-dependent pathway may be quite relevant to a variety of diseases (including Mycobacterium tuberculosis infection) that are characterized by granulomatous inflammation and the presence of multinucleated MA and in which a role for both GM-CSF and the P2X7R (8, 39–44) has been demonstrated. Our results also confirm the existence of an interplay between GM-CSF and P2X7R. This finding is in accordance with the reported interdependence between GM-CSF and IL-1β production in various models of arthritis (reviewed in Ref. 39) and with observations that GM-CSF in vivo priming for IL-1β is dependent on extracellular ATP (57), given that ATP acting at the P2X7R is required as a second signal for efficient release of biologically active IL-1β (40). In contrast to PMB, which interacts directly with the P2X7R possibly by inducing receptor oligomerization (34), GM-CSF did not exert any nonspecific direct effect on HEK293 cells transfected with the rat P2X7R and devoid of GM-CSF receptors (I. Lemaire and B. Zhang, unpublished observations). GM-CSF binds to a high-affinity receptor comprising a GM-CSF–specific α-chain and a signal transducing β-subunit that is shared with the IL-3 and IL-5 (58), and it is likely that its action occurs indirectly through a pathway that potentiates P2X7R function. In support of this, GM-CSF increased P2X7-dependent pore formation and potentiated the permeabilizing effect of submaximal ATP acting at the P2X7R. The stimulatory effect of GM-CSF observed in the absence of exogenously added ATP is likely related to low levels of ATP released by cells in culture and acting at P2X7, as it was inhibited by oATP and the P2X7 antagonists KN-62 and A740003. We also provide evidence that functional Panx-1 is involved in GM-CSF promotion of pore-forming activity and is required for stimulation of MA fusion. In this regard, there is consensus in the literature that Panx-1 is, or at least participates in, the P2X7 permeation pore (28, 29). However, thorough characterization of the P2X7 pore in the Panx-1 knockout animals showed that P2X7 responses are unaffected indicating that Panx-1 is not the P2X7 pore (S. Falzoni and F. Di Virgilio, manuscript in preparation). These observations raise the possibility that more than one permeabilization pathway may play a role in GM-CSF–dependent MA fusion. The precise interaction(s) between GM-CSF and the P2X7R is at present unclear, but it may involve phospholipid metabolism. In support of such assumption, GM-CSF has been shown to increase the formation of lysophosphatidylcholine in hematopoietic progenitor cells (59) as well as that of arachidonic acid in alveolar MA (60). In this respect, both arachidonic acid and lysophosphatidylcholine reportedly increase the potency of submaximal concentration of ATP at P2X7 receptors (61–63). Notably, structurally diverse lipids including lysophosphatidylcholine were found to increase P2X7 pore formation in response to 0.5 mM ATP (63), the concentration used in our study. The presence of a single long acyl chain in the lipid was important for this effect. Notably, PMB enhancing effect on P2X7R function also appears to be mediated via its long C16–C18 acyl chain (34). 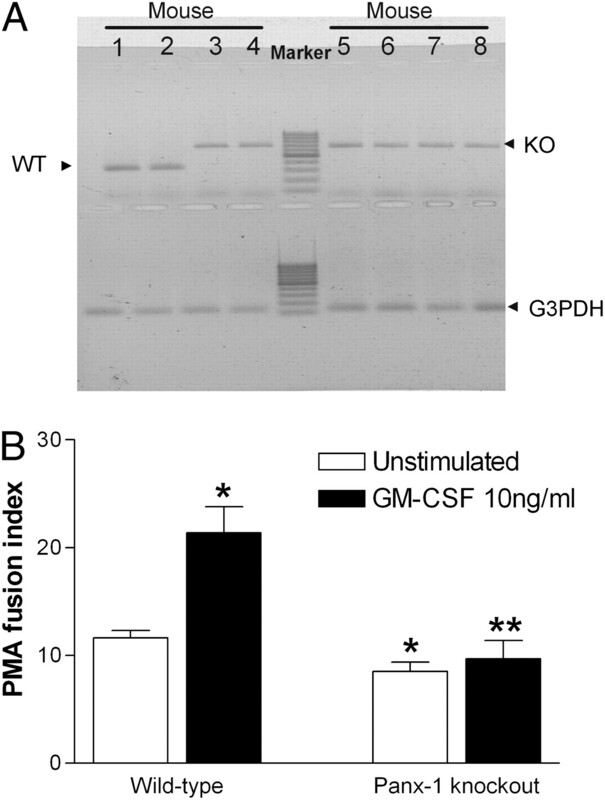 GM-CSF also increased phosphatidylserine (59). Phosphatidylserine exposure on the cell surface, which is mediated by rapid and reversible activation of P2X7R by low ATP concentrations (64), has been found to be necessary for myoblast (65), cytotrophoblast (66), and MA (67) fusion. However, in contrast to the GM-CSF promoting effect on pore formation seen in our study, phosphatidylserine did not potentiate P2X7 pore-forming activity in TPH-1 macrophage-like cells (63). Further studies would be necessary to clarify the role of these phospholipids in MA fusion. A second important finding of this study is that GM-CSF induction of multinucleated MA is dependent on extracellular ATP and its metabolite adenosine. Release of ATP from many cells is an important mechanism for intercellular communication through purinergic signaling (24), and recent evidence suggest that the P2X7R and Panx-1 hemichannel may be efficient pathway(s) for ATP release (25, 52, 53). In agreement with the former, extracellular ATP levels were decreased in MA from P2X7 knockout mice but were unaffected in MA lacking the Panx-1 gene confirming the direct implication of P2X7 but not Panx-1 in ATP release. In addition, we provide evidence that the promotion of cell fusion by GM-CSF in MA expressing P2X7R, and hence fully competent for ATP release, is potentiated by treatment with the ecto-enzyme apyrase, which rapidly degrades extracellular ATP. Moreover, such effect was inhibited by adenosine deaminase, which decreases adenosine levels, and suppression of MA fusion in P2X7 knockouts was rescued by addition of exogenous adenosine. Altogether, these findings suggest that GM-CSF promotion of multinucleated MA requires P2X7 purinergic signaling carried out through the release of ATP and its conversion into adenosine, which mediates MA fusion. In support of this, adenosine has been reported to promote the formation of multinucleated giant cell by human monocytes (68). In addition, lung inflammation resulting from elevated adenosine in adenosine deaminase-deficient mice is characterized by accumulation of multinucleated giant MA (69). Quite notably, in this animal model, elevated levels of adenosine are associated with upregulation of CD44 gene expression, a membrane glycoprotein involved in MA fusion (15) and expressed on multinucleated MA during the foreign body reaction to biomaterials (70). Therefore, upregulation of P2X7R may potentially concentrate ATP along the MA membrane ectonucleotidases facilitating its rapid local hydrolysis in adenosine. In turn, local increase of adenosine levels may upregulate CD44, a member of the specific protein machinery that promotes MA fusion (15). Besides the direct implication of P2X7-dependent signaling pathway in mediating GM-CSF promotion of MA fusion, our results also demonstrate a requirement for Panx-1. Based on the observations that P2X7 pore and ATP release are not affected in the Panx-1 knockout MA, it is likely that P2X7 and Panx-1 act independently in this process. Our findings also bring to light an interdependence between GM-CSF and the P2X7R and raise the possibility that other GM-CSF proinflammatory activities may be dependent on this pathway. Given the role of the P2X7R in triggering many inflammatory responses including the activation of the cryopyrin/IL-1β inflammasome and a cytokine cascade exerting potent inflammatory actions, the potential role of the P2X7R as an important downstream mediator of GM-CSF actions warrants further investigation. F.D.V. acts as a consultant for Cordex Pharma, Inc. and Affectis Pharma AG, biotech companies involved in the development of ATP-based drugs. This work was supported by the Natural Sciences and Engineering Research Council of Canada, the Canadian Institute of Health Research, the Italian Association for Cancer Research (Grant IG 5354), Telethon of Italy (Grant GGP06070), the Italian Space Agency, the Commission of European Communities (7th Framework Program HEALTH-F2-2007-202231), the Regione Emilia Romagna (research programs “Innovative approaches to the diagnosis of inflammatory diseases” and “Moniter”), and by institutional funds from the University of Ferrara. 2005. Macrophage fusion: the making of osteoclasts and giant cells. J. Exp. Med. 202: 337–340.
. 2009. Giant cell formation and function. Curr. Opin. Hematol. 16: 53–57.
. 2003. Immunophenotyping of macrophages in human pulmonary tuberculosis and sarcoidosis. Int. J. Exp. Pathol. 84: 289–304. 1992. CD4+ T cells cause multinucleated giant cells to form around Cryptococcus neoformans and confine the yeast within the primary site of infection in the respiratory tract. J. Exp. Med. 175: 1685–1695.
. 1985. Granulomatous inflammation in the acquired immune deficiency syndrome. Am. J. Clin. Pathol. 84: 598–602.
. 1996. Assessment of the role of GM-CSF in the cellular transformation and the development of erosive lesions around orthopaedic implants. Am. J. Clin. Pathol. 105: 628–639.
. 2001. Heightened ability of monocytes from sarcoidosis patients to form multi-nucleated giant cells in vitro by supernatants of concanavalin A-stimulated mononuclear cells. Clin. Exp. Immunol. 126: 151–156.
. 1996. M-CSF and GM-CSF promote alveolar macrophage differentiation into multinucleated giant cells with distinct phenotypes. J. Leukoc. Biol. 60: 509–518.
. 1996. Differential effects of macrophage- and granulocyte-macrophage colony-stimulating factors on cytokine gene expression during rat alveolar macrophage differentiation into multinucleated giant cells (MGC): role for IL-6 in type 2 MGC formation. J. Immunol. 157: 5118–5125.
. 2005. DC-STAMP is essential for cell-cell fusion in osteoclasts and foreign body giant cells. J. Exp. Med. 202: 345–351.
. 2009. Macrophage fusion, giant cell formation, and the foreign body response require matrix metalloproteinase 9. J. Leukoc. Biol. 85: 617–626.
. 2006. The intracellular domain of CD44 promotes the fusion of macrophages. Blood 107: 796–805.
. 2000. CD47, a ligand for the macrophage fusion receptor, participates in macrophage multinucleation. J. Biol. Chem. 275: 37984–37992.
. 1995. Molecular characterization of fusion regulatory protein-1 (FRP-1) that induces multinucleated giant cell formation of monocytes and HIV gp160-mediated cell fusion. FRP-1 and 4F2/CD98 are identical molecules. J. Immunol. 155: 3585–3592.
. 2001. Involvement of ADAM9 in multinucleated giant cell formation of blood monocytes. Cell. Immunol. 213: 104–113.
. 2003. Blockade of the pore-forming P2X7 receptor inhibits formation of multinucleated human osteoclasts in vitro. Calcif. Tissue Int. 73: 361–369.
. 2004. ATP downregulates P2X7 and inhibits osteoclast formation in RAW cells. Am. J. Physiol. Cell Physiol. 287: C403–C412.
. 1995. The purinergic P2Z receptor of human macrophage cells. Characterization and possible physiological role. J. Clin. Invest. 95: 1207–1216.
. 2003. Purinergic P2X7 receptor function in lung alveolar macrophages: pharmacologic characterization and bidirectional regulation by Th1 and Th2 cytokines. Drug Dev. Res. 59: 118–127.
. 2004. Inhibitory influences of xanthine oxidase inhibitor and angiotensin I-converting enzyme inhibitor on multinucleated giant cell formation from monocytes by downregulation of adhesion molecules and purinergic receptors. Br. J. Dermatol. 150: 205–210.
. 2005. A novel recombinant plasma membrane-targeted luciferase reveals a new pathway for ATP secretion. Mol. Biol. Cell 16: 3659–3665.
. 2002. Intercellular calcium signaling mediated by point-source burst release of ATP. Proc. Natl. Acad. Sci. USA 99: 9840–9845.
. 2001. Proteomic and functional evidence for a P2X7 receptor signalling complex. EMBO J. 20: 6347–6358.
. 2006. Pannexin-1 mediates large pore formation and interleukin-1beta release by the ATP-gated P2X7 receptor. EMBO J. 25: 5071–5082.
. 2007. Pannexin 1 is part of the pore forming unit of the P2X7 receptor death complex. FEBS Lett. 581: 483–488.
. 2008. P2X7 receptor-Pannexin-1 complex: pharmacology and signaling. Am. J. Physiol. Cell Physiol. 295: C752–C760.
. 2004. Modulation of intercellular communication in macrophages: possible interactions between GAP junctions and P2 receptors. J. Cell Sci. 117: 4717–4726.
. 2008. ATP release through connexin hemichannels and gap junction transfer of second messengers propagate Ca2+ signals across the inner ear. Proc. Natl. Acad. Sci. USA 105: 18770–18775.
. 2003. Multinucleated osteoclast formation in vivo and in vitro by P2X7 receptor-deficient mice. Crit. Rev. Eukaryot. Gene Expr. 13: 243–253.
. 2007. Modulation of P2X7 receptor functions by polymyxin B: crucial role of the hydrophobic tail of the antibiotic molecule. Br. J. Pharmacol. 150: 445–454.
. 2006. Involvement of the purinergic P2X7 receptor in the formation of multinucleated giant cells. J. Immunol. 177: 7257–7265.
. 2001. Muramyl dipeptide and mononuclear cell supernatant induce Langhans-type cells from human monocytes. J. Leukoc. Biol. 70: 386–394.
. 2004. Generation of multinucleated giant cells in vitro from bovine monocytes and macrophages. J. Vet. Med. Sci. 66: 1065–1069.
. 2007. Induction of DC-STAMP by alternative activation and downstream signaling mechanisms. J. Bone Miner. Res. 22: 992–1001.
. 2002. Absence of the P2X7 receptor alters leukocyte function and attenuates an inflammatory response. J. Immunol. 168: 6436–6445.
. 2000. Exacerbation of acute inflammatory arthritis by the colony-stimulating factors CSF-1 and granulocyte macrophage (GM)-CSF: evidence of macrophage infiltration and local proliferation. Clin. Exp. Immunol. 119: 361–367.
. 2005. Disruption of granulocyte macrophage-colony stimulating factor production in the lungs severely affects the ability of mice to control Mycobacterium tuberculosis infection. J. Leukoc. Biol. 77: 914–922.
. 2006. A Thr357 to Ser polymorphism in homozygous and compound heterozygous subjects causes absent or reduced P2X7 function and impairs ATP-induced mycobacterial killing by macrophages. J. Biol. Chem. 281: 2079–2086.
. 2004. Expression of P2 receptors at sites of chronic inflammation. Cell Tissue Res. 317: 289–298.
. 1997. Spontaneous cell fusion in macrophage cultures expressing high levels of the P2Z/P2X7 receptor. J. Cell Biol. 138: 697–706.
. 2003. Oxidized ATP (oATP) attenuates proinflammatory signaling via P2 receptor-independent mechanisms. Br. J. Pharmacol. 140: 507–519. 2003. Novel data point to a broader mechanism of action of oxidized ATP: the P2X7 receptor is not the only target. Br. J. Pharmacol. 140: 441–443.
. 2009. Mammalian P2X7 receptor pharmacology: comparison of recombinant mouse, rat and human P2X7 receptors. Br. J. Pharmacol. 157: 1203–1214.
. 2007. Mimetic peptides as blockers of connexin channel-facilitated intercellular communication. Cell Commun. Adhes. 14: 265–273.
. 2003. Photoliberating inositol-1,4,5-trisphosphate triggers ATP release that is blocked by the connexin mimetic peptide gap 26. Cell Calcium 33: 37–48.
. 2005. ATP released via gap junction hemichannels from the pigment epithelium regulates neural retinal progenitor proliferation. Neuron 46: 731–744.
. 2007. Modulation of membrane channel currents by gap junction protein mimetic peptides: size matters. Am. J. Physiol. Cell Physiol. 293: C1112–C1119.
. 2004. Pannexin membrane channels are mechanosensitive conduits for ATP. FEBS Lett. 572: 65–68.
. 2000. Imaging extracellular waves of glutamate during calcium signaling in cultured astrocytes. J. Neurosci. 20: 1800–1808.
. 2004. Regulation of adenosine receptor engagement by ecto-adenosine deaminase. FASEB J. 18: 131–133.
. 2007. P2 receptors in macrophage fusion and osteoclast formation. Purinergic Signal. 3: 53–57.
. 1995. GM-CSF rapidly primes mice for enhanced cytokine production in response to LPS and TNF. Cytokine 7: 291–295.
. 2000. A model for assembly and activation of the GM-CSF, IL-3 and IL-5 receptors: insights from activated mutants of the common β subunit. Exp. Hematol. 28: 231–243.
. 1995. Synergistic induction of phospholipid metabolism by granulocyte-macrophage colony stimulating factor and steel factor in human growth factor-dependent cell line, M07e. Lipids 30: 641–647.
. 2010. Cytosolic phospholipase a2 activation by Candida albicans in alveolar macrophages: role of dectin-1. Am. J. Respir. Cell Mol. Biol. 42: 415–423.
. 2006. Potentiation of native and recombinant P2X7-mediated calcium signaling by arachidonic acid in cultured cortical astrocytes and human embryonic kidney 293 cells. Mol. Pharmacol. 69: 1975–1983.
. 2007. Lysophosphatidylcholine potentiates Ca2+ influx, pore formation and p44/42 MAP kinase phosphorylation mediated by P2X7 receptor activation in mouse microglial cells. J. Neurochem. 102: 1518–1532.
. 2007. Agonist potency at P2X7 receptors is modulated by structurally diverse lipids. Br. J. Pharmacol. 152: 523–537.
. 2001. Rapid secretion of interleukin-1β by microvesicle shedding. Immunity 15: 825–835.
. 2001. Transient expression of phosphatidylserine at cell-cell contact areas is required for myotube formation. J. Cell Sci. 114: 3631–3642.
. 2004. Phosphatidylserine efflux and intercellular fusion in a BeWo model of human villous cytotrophoblast. Placenta 25: 396–407.
. 2009. The scavenger receptor CD36 plays a role in cytokine-induced macrophage fusion. J. Cell Sci. 122: 453–459.
. 1997. Adenosine A1 receptor promotion of multinucleated giant cell formation by human monocytes: a mechanism for methotrexate-induced nodulosis in rheumatoid arthritis. Arthritis Rheum. 40: 1308–1315.
. 2002. Gene expression profiling in inflammatory airway disease associated with elevated adenosine. Am. J. Physiol. Lung Cell. Mol. Physiol. 282: L169–L182.
. 2003. Distribution patterns of the membrane glycoprotein CD44 during the foreign-body reaction to a degradable biomaterial in rats and mice. J. Biomed. Mater. Res. A 64: 502–508.